Unlike President George. 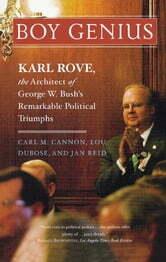 W. Bush, Karl Rove, his chief political adviser, is rarely "misunderestimated." Many of the president's opponents see Rove's hand in everything the president does. His friends, and the president himself, are just thankful he's on their side, and always has been. From their earliest days in Texas, Rove saw and tapped the potential of George W. Bush. "Political hacks like me wait a lifetime for a guy like this to come along," Rove said of the future president. The authors of Boy Genius fill readers in on the man, his methods, and his plans for the Republican majority for a fascinating, entertaining look at the Man Who Would be Kingmaker, an investigation that debunks myths as it reveals facts, and the story of exactly how American politics works now. From allegations of bugging his own office back in Texas, to shadowy dealings with Swift Boat veterans in the last election, Rove has played politics all the way to the highest levels, and though it sometimes isn't pretty, it works.